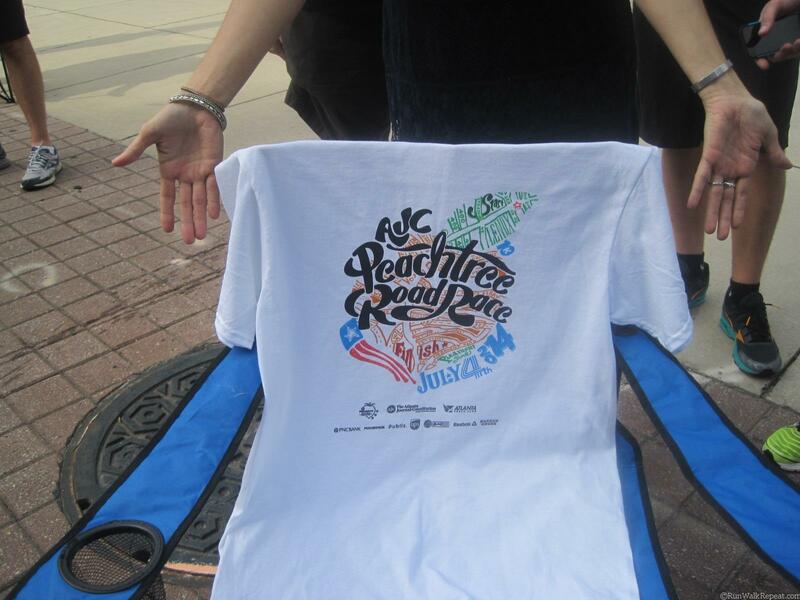 July 4th was the 45th running of the Peachtree Road Race in Atlanta: the world’s largest 10k. 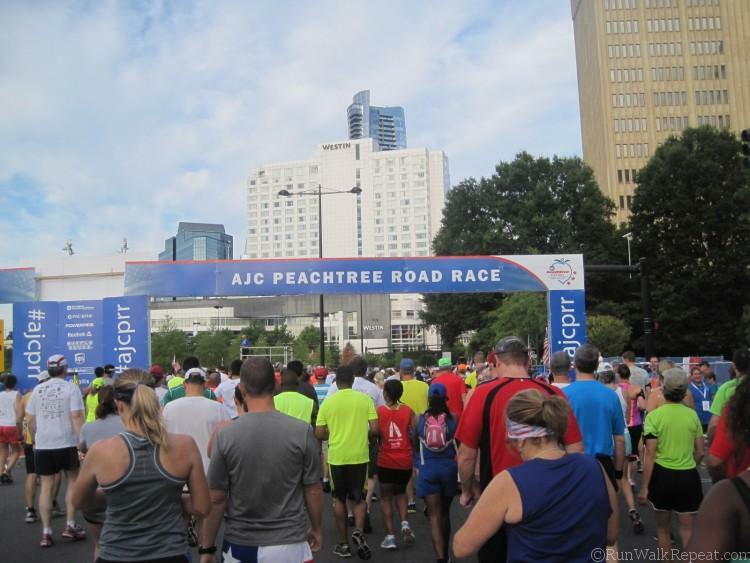 Showcasing the neighborhoods along Peachtree Road from Buckhead to Midtown Atlanta, this race is tradition for 60,000 runners and walkers, some 150,000 spectators and 3400 race volunteers. 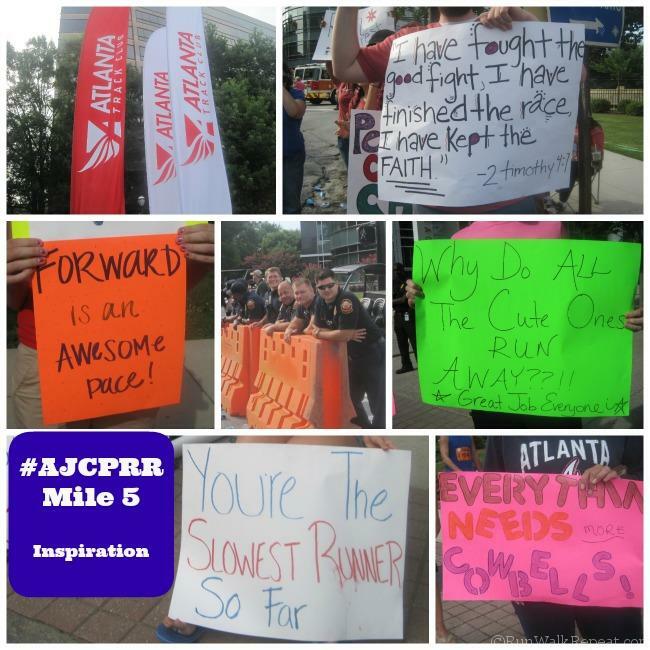 For good reason too – it is a super fun race bringing Atlanta together. All levels of athletic ability are represented and earning the coveted finishers shirt. 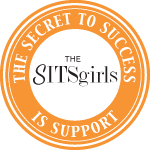 Yes its NOT a participant shirt, you must finish to receive yours, is a badge of honor. 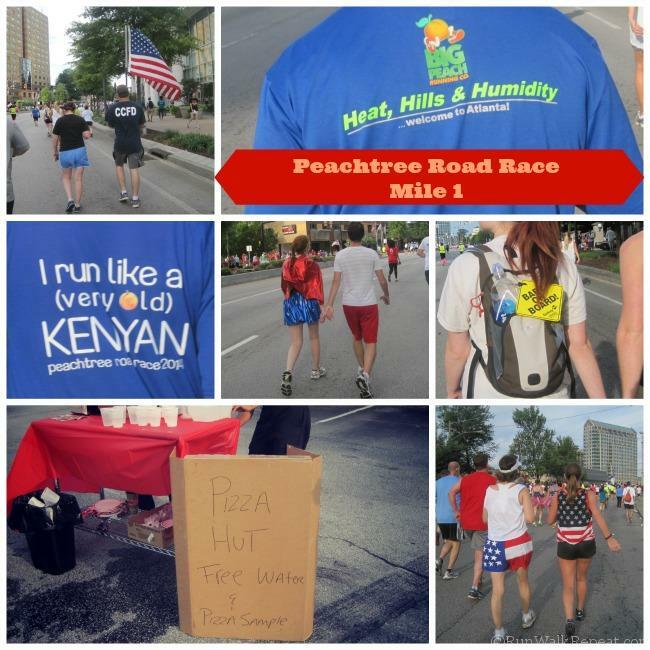 I participated in my sixth “running” of the Peachtree and I had an amazing time. 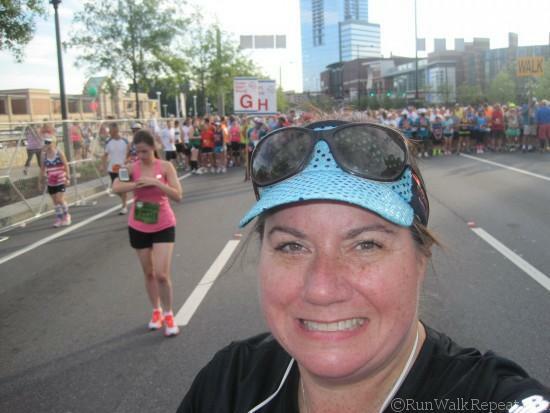 I ran by myself and took my own sweet time so I could document photos and chat with friends I met along the route. This year, I was really blown away by the spectators cheering us on. I am not exaggerating when I say 6.2 miles of cheerleaders on both sides of the road clapping, ringing cowbells, wishing you a happy 4th and encouraging you to keep going. 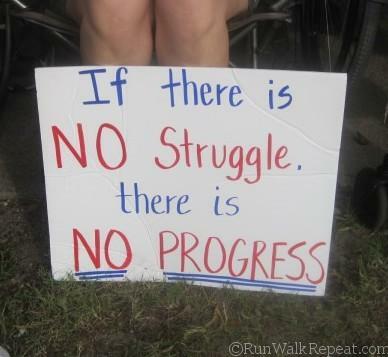 If you haven’t run or walked this race and have ever considered it, DO IT. Its fun and well the spectators make you feel like a rock star. Its a hilly course, but you know, its not as bad as it looks. With the first part being pretty much downhill, it makes the start pleasant and once you conquer the up hills hey its an accomplishment! The challenge of the race for me is logistics of the event starting and ending 6.2 miles apart. Luckily, public transportation is available and convenient to help with traffic. I park at a station about a mile and half from the start and just use the walk to the start as warmup – plus there is a Starbucks and Kroger along the walk if you want to use REAL bathrooms with plumbing. As you approach the start wave area from this direction, you also come across some port o potties which generally have very short lines and well don’t seem too bad in cleanliness – see my priorities here, will walk for clean potties. This was the third year I used this method and have to say, I love being in control of my destiny arriving at the start. You run into the BEST people at the Peachtree. 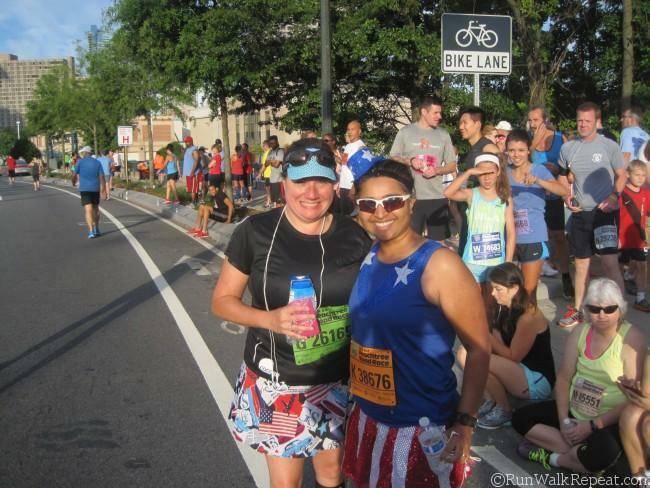 I approached the start waves and ran into Smitha the Faux Runner, who asked me to run with here. 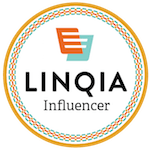 I knew I was going to take it slow – like REAL slow and politely, I hope, declined. I am glad I did, that girl got a PR..that is personal record. She was racing! You miss some fun stuff from the spectators when you whiz by. Its a big race, is it crowded? I say no, is it full of people – yes. The race is super organized, by Start Waves from letter A to Y, starting about every 4-5 minutes. 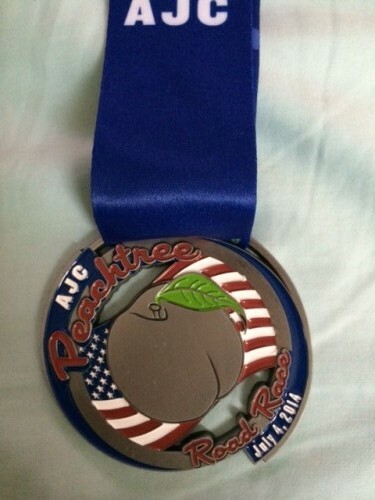 In 1999 I participated in my first Peachtree and joined the official training group where I learned from a race official in our group they had someone on top of one of the hotels at the start and when they saw the pack crowd of the start wave pretty much clear Piedmont Road – about 1/2 mile in, communicated via radio to start the next group. We did start a tad later than our projected start time, so I bet they still do this to an extent, which if fine by me. It helps spread out the runners and avoid congestion and crowds. This year the first wave left at 7:30am, the final group at 9:05am. I got to my start wave with about 3 groups starting in front of me, oops I missed the official start and 4 of the start waves, but hey less standing around waiting. I decided to start in the very back since I was going to be super slow. Its pretty strict getting into your start waves and you can see the next group behind me lined up ready to pass me by! Seeing the big flag at the start is one of my favorite moments as you approach the starting line, I get a little verklempt. There is so much patriotism in the air and just for a while, its seems like the polar nature of life today is put aside and we are one big happy running American family. Somewhere after the start Proud to Be an American was playing and I got teary – really its powerful! The first mile I pretty much just get in the groove of my intervals…. 30 second run, 30 second walk. I had a TON of space since I was at the very back of my start wave. Wasn’t long before I came up to my first group of high fiving sign wavers – the group behind me hadn’t even started yet. How can you NOT be happy with these cheerleaders. Really there were a TON of fun signs on the course. And some amazing spectators too…. I will try to highlight some of my favorites because well I could write all night and I need to go to bed. Highlights of mile one? Free Pizza and water, yeah before the water stop – how nice, some fun shirts and a Wonder woman, she got a few shout outs too. FYI, lots of patriotic themed clothing, and a TON of Wonder Women, Captain Americas and Uncle Sams. I missed the mile one sign…oops, too busy checking out the band playing and the start wave group behind mine now whizzing by me. The first bank of port a potties I noticed was at mile 1.15 per my Garmin. The crowds were getting a little rowdy and some carb loaders were handing out beer to the Harlem Globetrotters – PBR at 8:15, um no thanks…not even 8:15PM IMO. 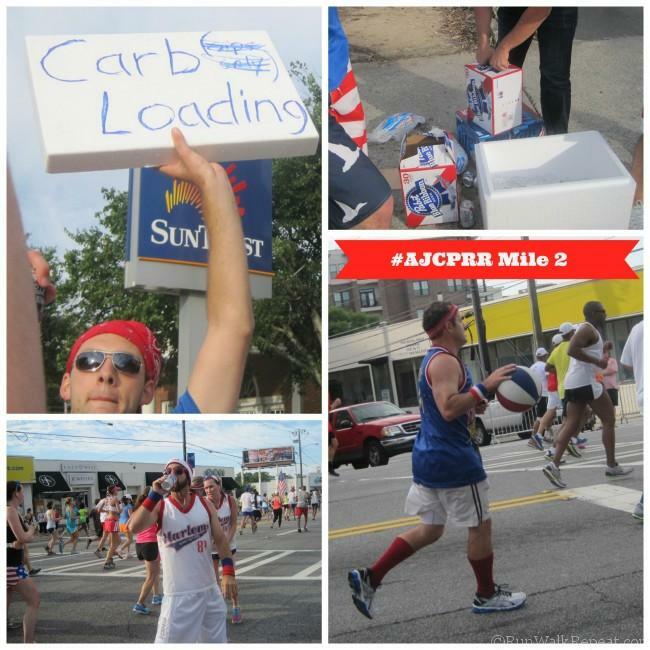 True story, I saw a spectator steel the ball from that PBR drinking Globetrotter, so let this be a lesson, when dribbling, even at the Peachtree Road Race, keep your eye on the ball. Is PBR at 8:15am EVER a good idea? 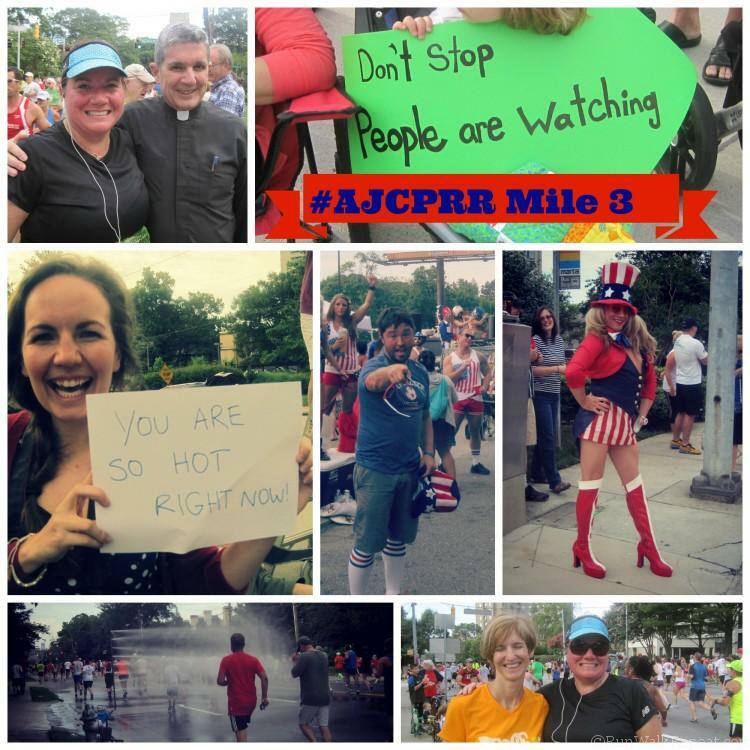 Two highlights of mile 2, I saw a guy in a vintage Peachtree Finishers T, circa 1977 and you hit the Cathedral of St Phillip which has “holy water” spraying out on the street and you get a blessing from the clergy. The third mile is my favorite mile, its my old homestead. I passed by the Cathedral of Christ the King, my Alma mater and church of my baptism, first communion, marriage and lots of Sundays…a total treat running into my very favorite priest in the whole world whom I have known since I was 8 years old..you know like 10 years. 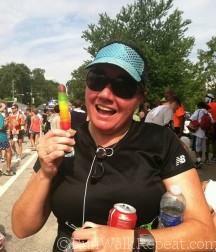 Also saw running buddy Elyn who is sidelined right now with an ankle injury ….all smiles. Peaches was back on the corner of Lindbergh, looking as festive as last year sans tiara. And those crazy Fur Bus people were recognizing the best runners with a marching band and handing out…yep Beer. I passed, but appreciated the shout out and high five a tambourine, hey that was a first for me. Just before mile 3 begins the first big hill. 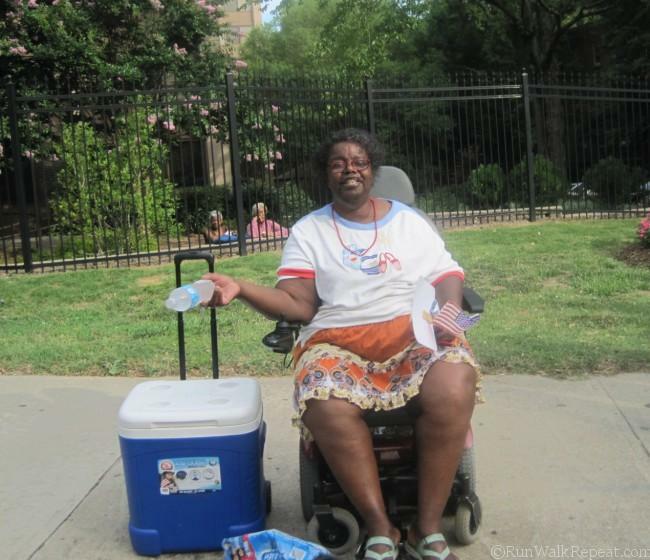 It kind of stinks, but this kind lady was outside the retirement tower with her cooler saying, “I am fresh out of cold beer, so this cold water will have to do”. She was just so enthusiastic and loud, definitely one of the highlights of my run. Thank you so much water lady – I forgot I was approaching Cardiac hill going uphill because of your cheerful disposition. Cardiac hill is next, and its steep. The most inspiring part of the race, it passes by Shepherd Spinal Center. So many patients and families are out there cheering on the runners. Patients and their families at Shepherd were yelling out encouragement. Its a moment like no other on any other race. LOTS of people were stopping and shaking the guy’s hand in the wheelchair next to the sign – some hugging and some saying “I am praying for y’all”. The man in the Orange running shirt was smiling and just thanking people encouraging all who ran by. I thought, wow, this guy knows ALOT of people. When I saw the news recap of the race, I saw a story on Andrew Powell, a local tri-athlete who was injured this past April when biking in New Orleans preparing for a mini triathalon. His brother in law riding with him, was killed. 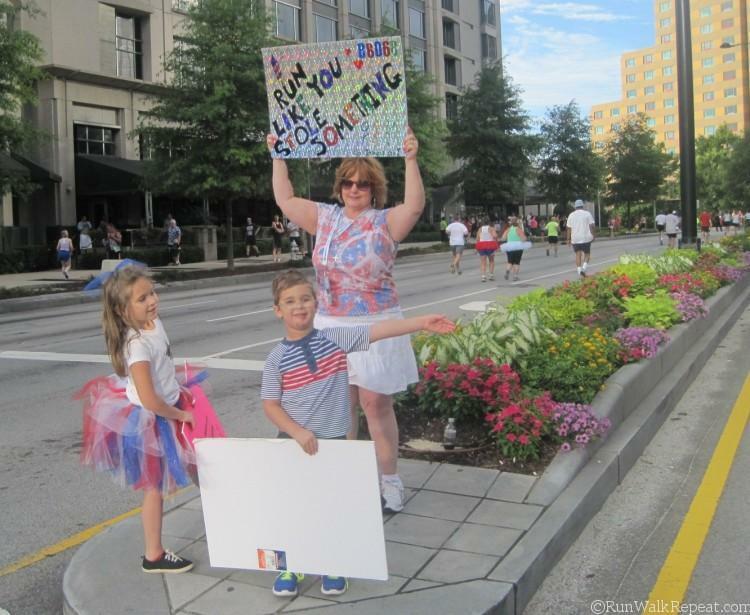 Powells first race was the Peachtree Road Race and he was the man whose family had this sign. 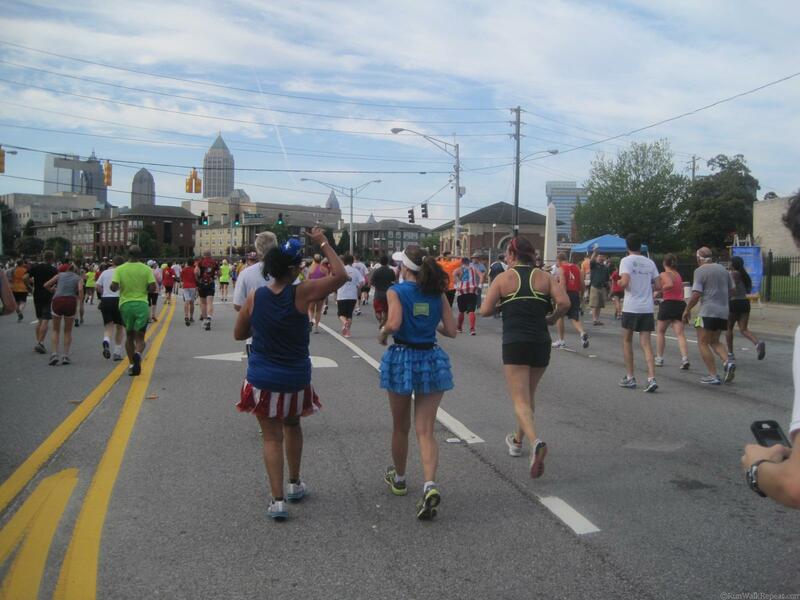 I am always a bit of a mess during this part of the race as we continue towards Piedmont Hospital, where Caleb my son was born premature 16 weeks and lived 9 days. 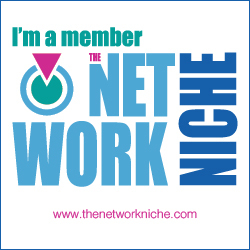 The NICU nurses, doctors, patients and families of them all always on my mind as I reach the top. Its also the last place I told my mom I loved her before she passed away suddenly of cardiac arrest. If you ever run this race with me or see me around this point and wonder why I am silent and teary eyed, that is why. 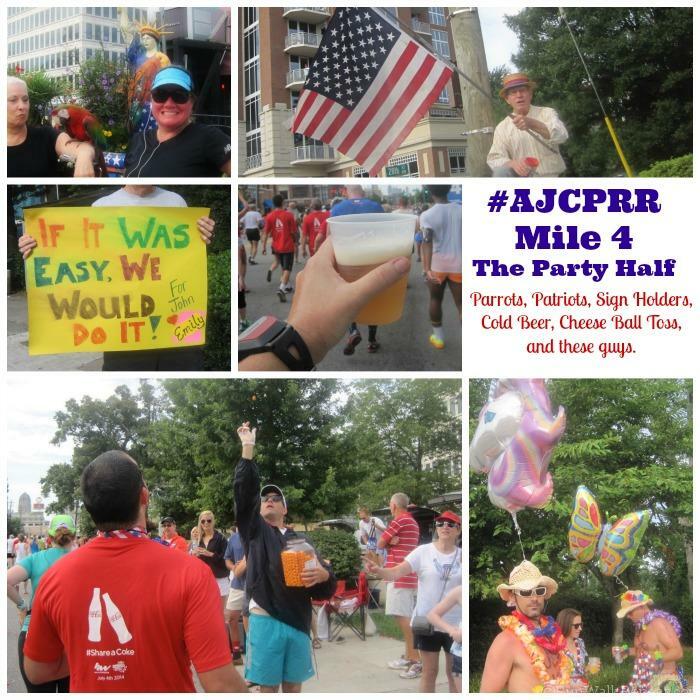 Never fear, mile 4 has some fun too…I think the last half mile is one of the Party Zones…. I HAD to have a couple sips and tossed the rest, I had turned down SO many beers up until now. After I passed the mile 4 sign and started into mile 5, I saw some familiar sparkle. Smitha who was running with Amy. I love y’all, but I was so happy that I was doing my own little thing because I had to really hoof it to catch up with them! But I caught them we took a selfie and on they went…oh they invited me to join their run, but I was taking my own sweet time. Smitha and Amy Bustin It. I made it up the hill…AGAIN, the last big one and started the approach to Midtown. LOTS of great signs and sites this leg of the race and the crowds were getting insane on the spectator side. I finally saw a finisher’s shirt and was never more excited to see a WHITE T shirt – thank you kind spectator for sharing since last few years while the design has been great, the beige, gray and black t shirt color not my thang. 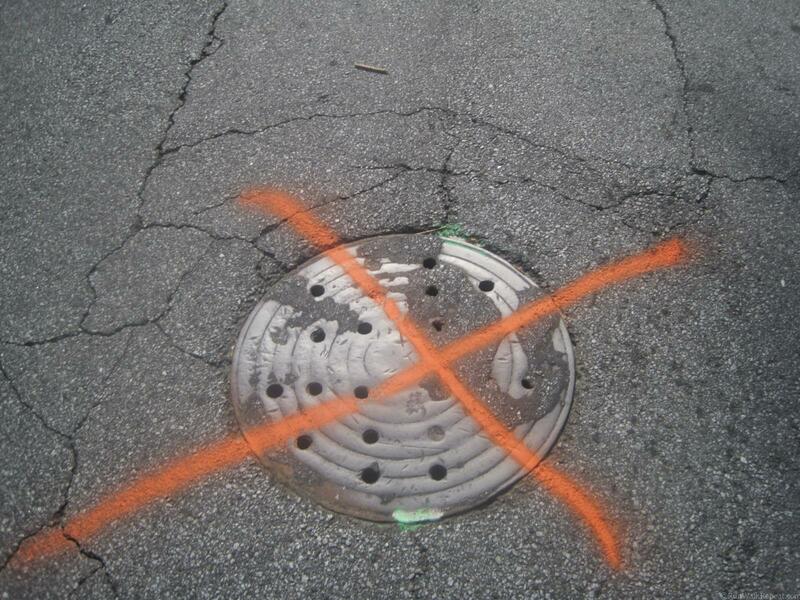 I was so excited when I turned the corner off of Peachtree Street onto 10th and heard “Julie…….Julie……..” being yelled from the sidelines. 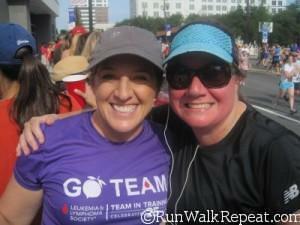 Yeah, my friend Jill – a fab runner herself and Team In Training Coach pulled me from the crowd. Apparently they always watch the race from this spot and had QUITE the spread. I chatted with the TNT peeps who were quite nice and reported I was still ahead of Meb. Hmm…maybe I should run sometime with TNT, they were having fun and hey, they are going to the Napa Half. The BEST TNT Coach Eva..Go Jilly! 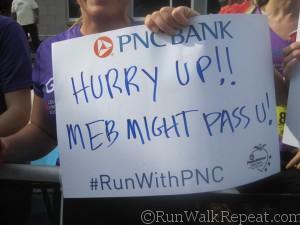 I did NOT run slow enough for Meb to pass me…bwahahaha. I approached the finish feeling GREAT. I took it easy and had a blast. 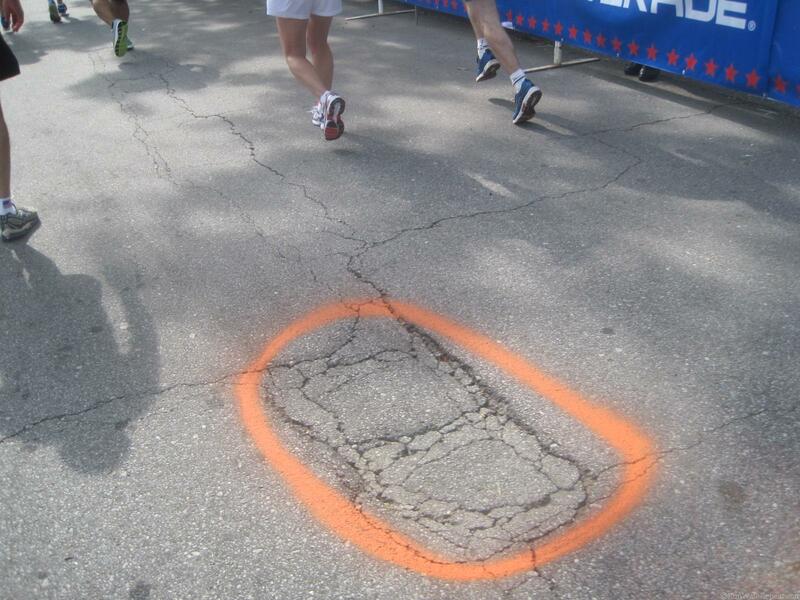 I noticed something I want to thank the organizers of the race for…as you approached the finish, they marked potholes with spray paint. AWWWW, thanks for the “Hey, let’s be careful out there” paint job. As I approached the finish I decided to tribute The Breakfast Club with my Bender arm raise – Pitch Perfect too, in triumph…. I know you are now singing “As you walk on by, will you call my name: aren’t you? I say La, la la la la, la la la la…. NOTE..I AM buying my finisher pic, just waiting for the rest of my photos to load to see I want to purchase them all. 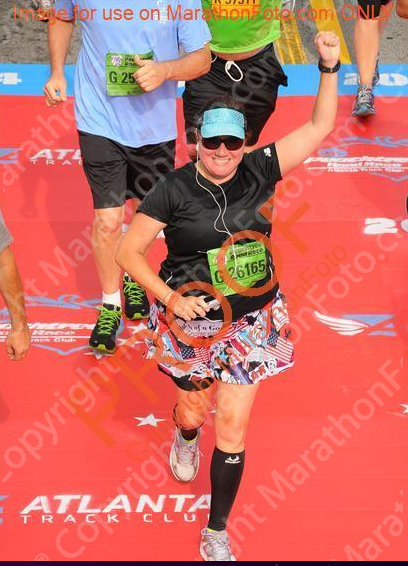 Never fear Marathonfoto, you shall get more of my $$, just waiting on all photos to be uploaded AND a coupon. 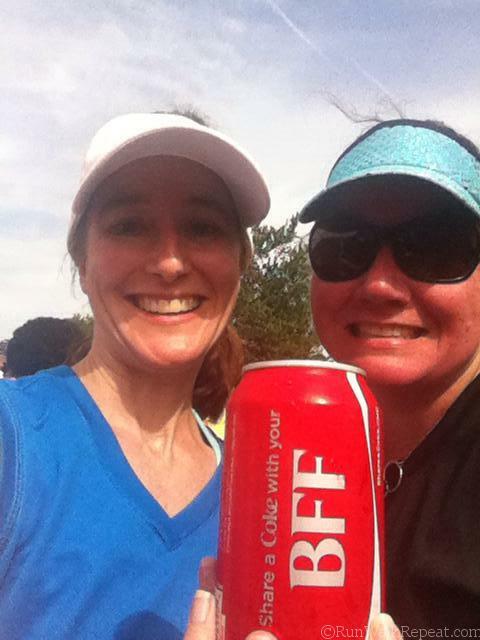 I found Amy, and we shared a BFF Edition Coke- the really need a BRF can and I had the best popsicle ever thanks to Bluebell. Yeah those are my reading glasses on my shirt…ALL photos in post taken blind..not bad at all for an old lady. A shout out to Publix too… not only were they passing out bottled water when we ran by a store, at the finish for all they handed out Bananas, Peaches and Pretzels after the race. MUST ADD, you think these were an expensive delicacy the way some people were loading up their bags….not kidding. Really? Its for POST race refreshment, not to feed the family or tide you over through the harsh winter that is coming per Ned Stark. I did NOT purchase the medal when I registered, but they were a lot prettier this year than last. Thank you Julia for the photo. My time….well all time slow record… 1:40 and I enjoyed EVERY SECOND. I got my registration’s worth…ran a lovely course, OK I walked up some hills, saw some old friends on the side and chatted and took some great photos. For me this is tradition and I love to savor every step. And yeah, working on a video too with all my photos…brace yourselves, its coming. It amazes me how the spectators step up and entertain the runners, along with the bands along the way. There is NOTHING like this race that I have experienced. Atlanta Track Club, you really know how to put on a GREAT race, thanks so much for this tradition. To those who came out to cheer, feed, inspire and make me laugh thanks so much. See you next year. 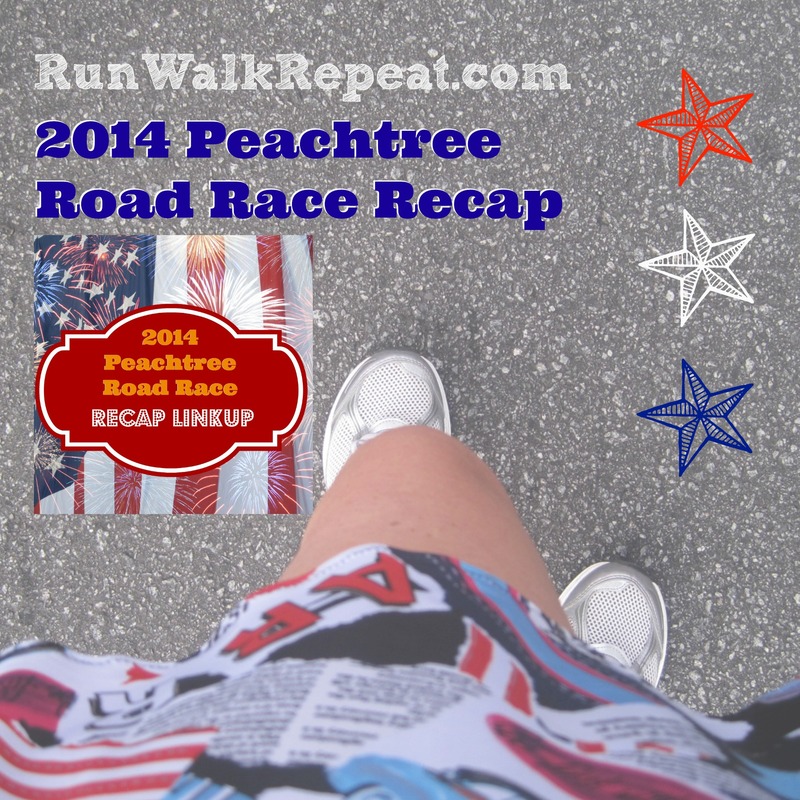 Have you run the Peachtree Road Race? 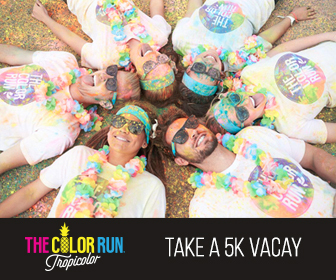 What is the biggest race you have run?